Fiona is a 'stand out' Senior Systems & Business Analysis Consultant who brings fresh approaches, solid experience and a commitment to deliver to every client. She helps our clients understand their business and technology problems and systematically delivers the right changes to resolve those problems. She thrives on new challenges and introduces innovative practices such as design thinking, business intelligence and customer experience mapping to make a bigger contribution to our clients. Testing – test planning, manual and automated testing, defect analysis. "It's an exciting time for organisations who have new ways of making a difference to their customers and communities. Recent NZ research showed that 'customer experience' is the most important thing on executives minds. We also see government and private organisations focusing more on how they can use data to make better decisions. Organisations are also changing the way they work to better suit the new world. 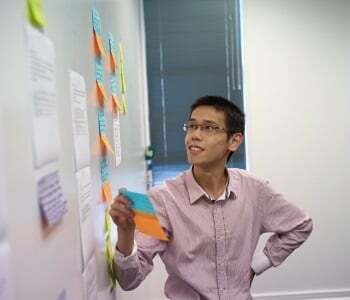 I'm excited to be working across all of these areas for clients with specialist skills in analysis, business intelligence, Agile and Scrum practices, customer experience and service design." Fiona is working towards her Bachelor of Applied Science – Information Systems and Technology through The Open Polytechnic of New Zealand. She is a Certified ScrumMaster and Certified Scrum Product Owner and holds a Certificate in Web Design and Writing. When not working or studying, Fiona is a Pokémon Master who enjoys getting out and about with her friends, family, random strangers and her Cavalier King Charles Spaniel Scampy on a mission to catch em all!